Samudrika Convention Centre, Willingdon Island, Kochi, Ernakulam. The 4th Edition of medic Expo is the Kerala’s largest Medical, Dental Equipment show, The expo will be jointly Organised by SRS, Al-Med Equipments, Amaryllis etc, MEDIC Expo 2015 is offering attractive early bird discount offers to all the medical equipment manufacturers. Medic Expo 2015 will be held from February 28 to March 1st, 2015 at Samudrika Convention Centre, Willingdon Island, Kochi, Ernakulam. The Medic Expo 2015 (Equipment Expo) , is an exhibition which provides an opportunity for the participating companies to display their product and services to the gamut of visitors globally from the medical, dental and healthcare industries. The expo will bring eminent personalities together from various sectors of healthcare industries. Medic/Equipment Expo 2015 will have visitors from India and mainly from whole of Kerala, Tamil Nadu, Karnataka, Goa, etc. 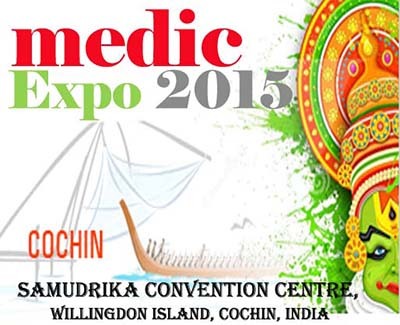 (MEDIC Expo 2015 is doing huge visitors promotion in the interior region of Tamil Nadu, Karnataka and Goa). Hospital procurement department, Hospital Administrators, Medical Directors, biomedical engineers, Doctors will be invited to see the new technology medical equipment’s as well as to attend the medical conferences. Healthcare is one of the major sectors fuelling the growth of the Indian economy ‘AROGYA 2015’ (An Expo of Hospitals) are ideal platforms to look at the industry from a holistic perspective. The exhibition will serve as a platform to provide patients guidance with respect to their rights and responsibilities for their healthcare needs. Medical check-ups, alternate treatments, medically supervised health programmes, special consultation and advices, will also be available for everyone.